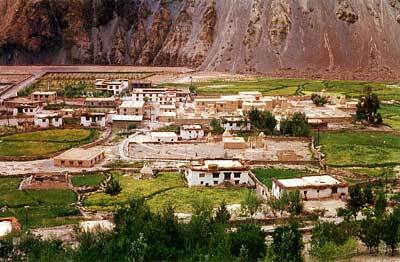 LAHUL SPITI, the land of monasteries and mysteries of gods and deities is the divine gift of nature on earth. The snow capped Himalayas present a panoramic pageantry of exquisite creations of nature. Located in the dizzy height of the Himalayas with passes that remain closed for six months, Lahul and Spiti were till now a forbidden land. Now this area has been opened to the adventurous people who can have a glimpse of the magnificent valley. The world famous ancient monastery located on the bank of river Spiti offers a valuable window to Tibetan culture: Art and architecture here are as stupendous as in Ajanta caves, The monastic complex consisting of nine Shrines was constructed and renovated between 10 th & l5th century and an inner chapel suggests its foundation in 996 AD. The most important amongst these shrine is Dukhung. Here 33 stucco images of Buddha. Bodhisatvas gods and goddess surround the central figure of Vairochana. Every inch of the wall is embellished with beautiful paintings which are as old as the monastery. The life of Sakyamuni Buddlha is also elegantly depicted here. The gompa also contains wooden images and a precious library of manuscripts. Tabo was built before Alchi monastery of LadaKh, nevertheless, both of them contain huge repository of contemporary Kashmiri art of the 11 th century. 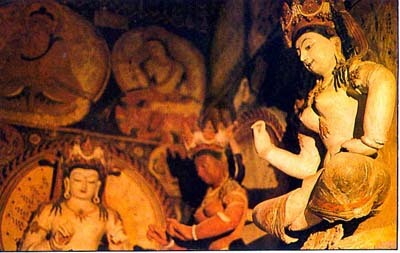 It also bridges missing links between artistic styles of India and Tibet. The soft and tender expression of the figures are the conspicuous influence of Ajanta. Tabo is one of the few monuments where one can study continuous development of Western Tibetan art from 11th to 2Oth centuries. It goes to the credit of the Archaeological Survey of India, which has been deputing its team of experts year after year to undertake the challenging task of conservation of the historical monument. Some scholars are of the view that some of the murals of Tabo monastery are as old as the monastery itself. Others offering a conservating estimate date the wall paintings to 500 years back. The Tabo complex is surrounded on all the four sides by a high mud wall. Of nine structures, all single storied, the biggest the oldest and the finest is one called Duwang Lakhang. In this structure, the spacious chaitya (hall) is used by monks for daily prayers. There is no window but a small image of the four-faced Buddha Vairochana is a magnificent idol and represents dharma: chakra-pravartan mudra. 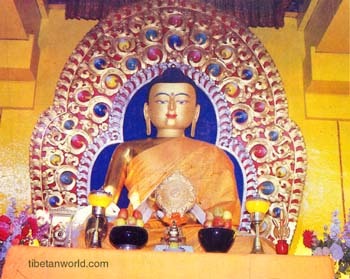 Behind the statue is a figure of Amitay Buddha seated in the innermost sanctum. Of the stucco idols, one very magnificent is of bodhisatva Maitreya seated on a high lotus seat. The 5.21 metre high image represent future Buddha in paryanka sasana and in dharma-chakra-pravartan mudra . The curly hair on the head is an indication of the influence of the Gupta period. In the open courtyard around the built-up edifices, are seen a number of stupas, which have been raised to house the sacred ashes (mortal remains) of the Lamas who breathed their last while staying in this holy place.